A dying star is throwing a cosmic tantrum in this combined image from NASA's Spitzer Space Telescope and the Galaxy Evolution Explorer (GALEX), which NASA has lent to the California Institute of Technology in Pasadena. In death, the star's dusty outer layers are unraveling into space, glowing from the intense ultraviolet radiation being pumped out by the hot stellar core. 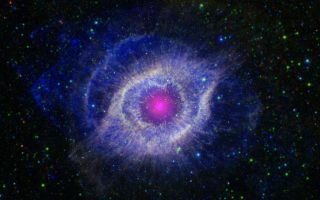 This stunning space wallpaper shows the Helix nebula, lies 650 light-years away, in the constellation of Aquarius. Also known by the catalog number NGC 7293, it is a typical example of a class of objects called planetary nebulae. Discovered in the 18th century, these cosmic works of art were erroneously named for their resemblance to gas-giant planets.